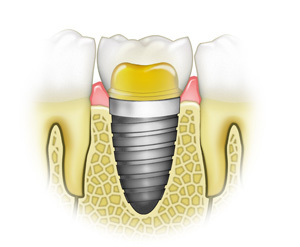 A dental implant is a titanium-alloy screw that mimics the root of a tooth. On top of this implant, a crown can be made to mimic your natural tooth. 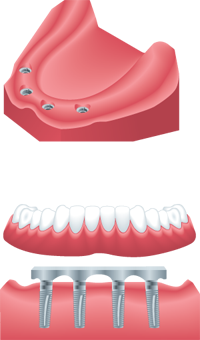 If you are missing a few teeth, multiple implants can be placed to support a fixed bridge, or to aid in the attachments for a removable denture. Basically, implants can be used in numerous styles of dental treatment. Tooth loss can be very devastating to the mouth and to the patient! When a tooth is missing, it will cause the other neighboring teeth to shift and move into the missing space. The bone in this area starts to get thinner and resorb as well. The opposing teeth can also start to move into the space and change the bite over time. This can have a negative effect on chewing ability and on the patient’s smile, leading to the patient becoming more self-conscious. Everyone wants to be smiling healthy for life after all. When multiple teeth are missing, chewing efficiency will greatly decrease and a patient may not be able to eat certain foods. Of course a person’s appearance will be greatly altered, making the person look older. Overall, missing teeth can have a negative impact on the quality of life. Don’t let this happen to you! Dr. Chiu and Dr. Singh are well trained to use implants to restore your mouth back to healthy function and look esthetic as well. We want you to be smiling and eating well now and even decades from today! For a single missing tooth, an implant is placed into the bone, to mimic the root. Once the implant heals with the patient’s bone, impressions are made and a crown is frabricated to look and feel like a natural tooth. For multiple missing teeth, two or more implants can be placed. Bridges can be created on top of the implants, which provide the strength and supported needed to allow patients to function properly again. When a patient has lost all their teeth, or been missing teeth for a while, there is still hope! There are ways to graft and increase the bone volume, so that implants can be placed, or strategic placement of the implants may be possible to avoid grafting the bone. Multiple implants may be placed and fixed crowns and bridges can be fabricated to return the patient back to a full complement of teeth. For those requiring or having loose removable dentures, we can secure them with implants. This type of restoration has the benefit of being removable by the patient for easy hygiene. After reinsertion into the mouth, the dentures stay secure and allow patients to smile with confidence and enjoy their favorite foods! Please call us today and ask about which treatment is ideal for you!